92% of home buyers search for homes on the Internet. Embassy Group, which spearheads the real estate market in India, had to ramp up its digital marketing strategy. The real estate giant decided to solve this by turning big media spends on TV into virtual point-of-sale on digital (mobile) using Zapr’s unique cross-screen targeting. Embassy spent heavily on TV by advertising on select channels. However, they had to ensure underexposed priority markets were engaged at the most optimal level of exposure. Through Zapr, they were able to identify the viewers of their TV commercials and target them again on mobile, until they reach an optimal frequency of exposure. By targeting only underexposed audiences, Embassy could save 60% of costs. Embassy Group, with its technology-driven strategy, has taken the bold step of being one of the pioneer users of new-age engagement platforms via Zapr and as a result, has seen massive Return of Investment. 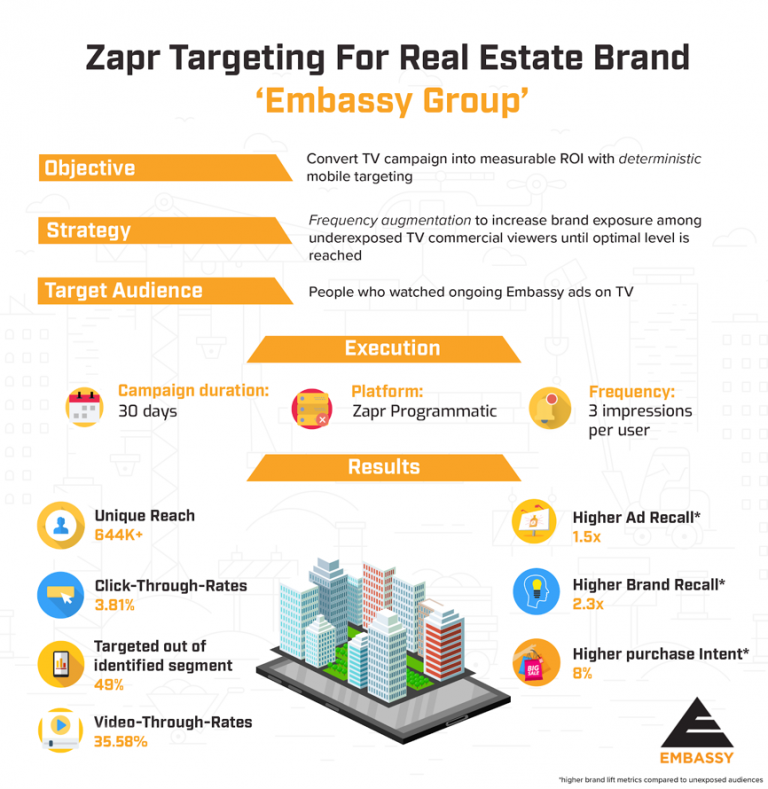 Download our case study to read in detail how Embassy adopted the first deterministic cross-screen targeting for real estate.